Releases of George Antheil’s music seem to be accelerating. I had just reviewed the new Chandos release of his 4th and 5th Symphonies when the vivacious, colourful music of this new Capriccio album arrived (with, I must add, however, no admission in its booklet of the rather small total playing time!) No matter, this time less is much. Antheil’s brief Jazz Symphony is weird and wild, employing three pianos to significant but not overwhelming effect and there is an equally compelling saxophone solo. It was written very soon after George Gershwin’s Rhapsody in Blue and the thrusting, high-spirited American influence is undeniable. During its twelve minutes it spans many moods: from the abrupt, sour and strident with moments of ‘vulgarity’, through to extravagant, elegant waltz melodies reminiscent of Lehar, all rounded off with a horse laugh to an abrupt conclusion. But its many extraordinary transitions are handled with remarkable aplomb. Steffens clearly relishes the extrovert contortions and technical challenges of this oddly enjoyable work. The more substantial Concerto for Piano and Orchestra No. 1 was composed three years earlier, and while it has some jazz inflections, the main influence is that of Stravinsky - plainly, Le sacre du printemps and Petrushka. The music is, accordingly, strident, barely tonal and crazily wild. It glitters and skitters. It bombards the senses. The cadenza is combustible and here I must commend the scintillating virtuoso playing of Frank Dupree, obviously at home with this extraordinary music that also nods, a little, towards Gershwin’s style and oddly anticipates the insouciance of Poulenc’s concertos. I should add that the quieter, slow music in this concerto is remarkable – eerie, foggy and unsettling, it is something approaching film music. Antheil’s work for the cinema is more obviously intimated in the narrative-style music of Capital of the World; i.e., as far as the story goes, Madrid, where the hapless rurally-reared hero, Paco, aims for glory in the bullring against the better judgement and advice of an experienced bullfighter. And, of course, poor Paco comes to grief; he dies accidentally; hit by a knife. The music, true to its setting, not only strives for dramatic effect but also for Spanish atmosphere. The movement titles are suggestive enough. ‘The Tailor Shop’ contrasts Spanish swagger with dreamy sentimentality as Paco, perhaps, day dreams of triumph in the bullfighter’s costume he is presumably having fitted. The middle movement ‘Meditation’ is dreamily introspective. Much of it is reminiscent of de Falla’s Nights in the Gardens of Spain; it is a perfumed nocturne, unhappily dashed, eventually, by weird and disturbing material as reality checks in. Finally, the third movement entitled ‘Knife Dance and Farruca’ is brutal and tragic, the music quirky and gawky one almost gets the impression that Antheil regards poor Paco as something akin to Jerry Lewis. On this evidence one begins to wonder why so little Antheil film music has been recorded. Please see the footnote at the end of this review. Finally, there is another colourful composition – Archipelago “Rhumba.” Antheil explained: “The rumba rhythm began engaging my imagination and I composed an entire folder full of South American and Caribbean music which I called Archipelago.” This time the influence is Darius Milhaud and his Le boeuf sur le toit. 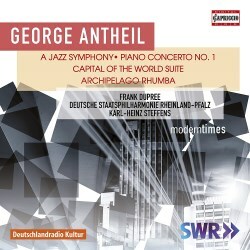 Antheil delivers a joyous, radiant, riotously coloured composition that sweeps everything before it. There is attractive material for piano and harp and an evocative quieter pastoral interlude complete with exotic birdsong. A colourful musical cavalcade infectiously performed. As the Founding Editor of Film Music on the Web (now defunct) I would like to make some comments on the film music of George Antheil (he composed scores for nearly 30 films) that has been largely ignored by the recording companies. Many film music fans will recall the splendid series of classic film scores recorded by Charles Gerhardt in the 1960s. I cannot recall the inclusion of one Antheil score even in the ‘Music for the Films of Humphrey Bogart’ collection yet Antheil wrote the music for no less than four Bogart movies: Knock on Any Door (1949), Tokyo Joe (1949) In A Lonely Place (the celebrated film noir from1950) and Sirocco (1951). Perhaps it was felt that Antheil’s tough uncompromising music well suited Bogart’s characterisations? Antheil also wrote the score for two early Cecil B. DeMille films: The Plainsman (1936 - starring Gary Cooper) and The Buccaneer (1938). Amongst his other films are Spectre of the Rose (1946 – set in the world of ballet), The Pride and the Passion (with Cary Grant and Sophia Loren), and Dementia (a much-lauded score for this 1955 film). The Pride and the Passion, based on C.S. Forester’s novel The Gun, is Antheil’s only movie score to have been commercially recorded (http://www.kritzerland.com/prideKings.htm). It is to be hoped that Chandos or Capriccio will consider including some Antheil film music in any future albums.